The second quarter of 2018 has officially kicked off, and it brings with it an environment of synchronized global growth, rising inflation, higher volatility and more economic uncertainty. We have updated our three key 2018 investment themes against this backdrop, as we write in our Q2 2018 Global Investment Outlook. Three charts help illustrate these updated themes, which we see shaping economies and markets this year. 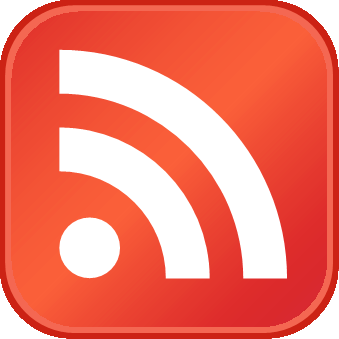 The U.S. economy is getting a fiscal shot in the arm just as it reaches full capacity. This is the first time in decades that hefty U.S. stimulus is coming outside of a recession. We see tax cuts and public spending adding about one percentage point to growth this year. 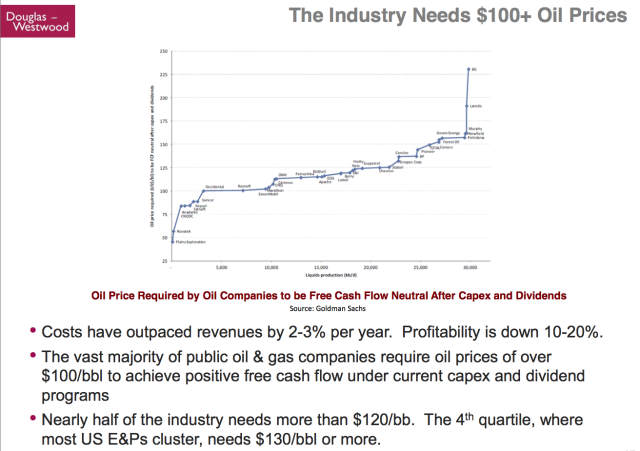 See the Hello, big stimulus chart below. 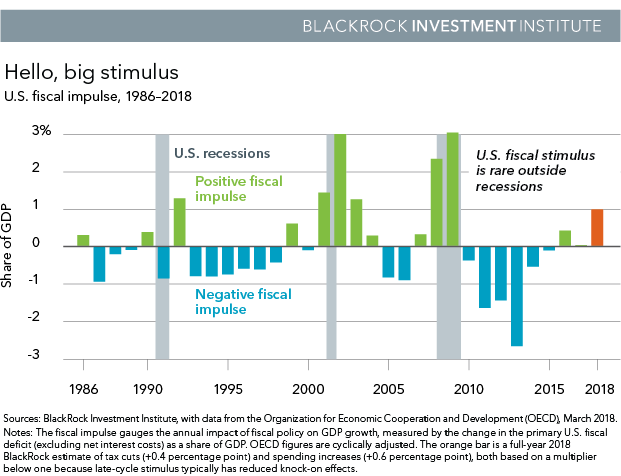 Faster growth could hasten the expansion’s expiration date and shorten the cycle if fiscal stimulus does not come with increased productivity. The tax overhaul, however, gives businesses an incentive to further boost investment after years of caution. Greater capex and pent-up productivity gains from technology investment could lift potential growth over time, helping to contain any overheating. See our February Global macro outlook for more details. A capex upswing may also help drive emerging market (EM) export growth, reinforcing the global cycle, we find. EM growth is set to quicken in 2018, even if China modestly slows. We see still robust growth in Europe, albeit at a slower pace than consensus, with ample spare capacity left. Overall, we see synchronized global growth providing a solid foundation for equities. U.S. tax and spending plans have lit a fire under earnings growth, which was already gaining momentum on the back of economic strength. Read more about our asset preferences in our full Q2 2018 Global Investment Outlook. Inflation is perking up, led by the U.S. Our Inflation GPS points to further upside around the world as well, a big shift from 2017. U.S. inflation is moving back toward target, and this supports our view that the Federal Reserve will likely forge ahead with raising rates. Markets have long doubted the Fed’s resolve to normalize monetary policy. The market-implied path of interest rates for the coming 12 months has lagged that indicated by Federal Open Market Committee (FOMC) policymakers. Markets have now caught up, and we believe this points to a stable backdrop for risk assets. Two additional rate rises are priced in for 2018, and we could see three due to robust growth and moderately rising inflation. 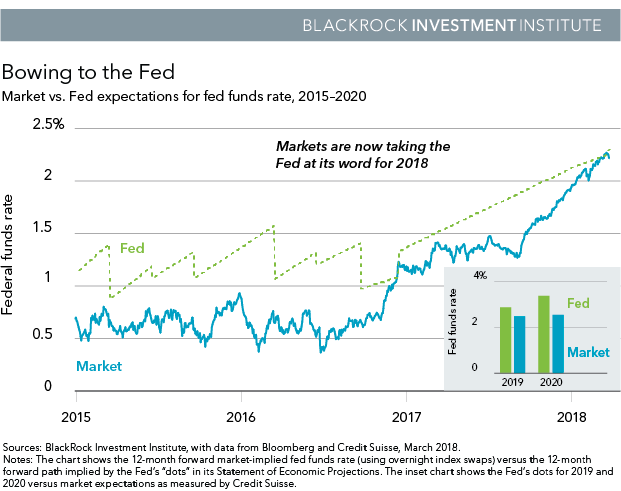 For 2019 and 2020, however, the Fed remains ahead of the market. See the Bowing to the Fed chart below. An even faster pace of tightening appears unlikely for now. We could see temporary inflation overshoots, but it will likely take some time for any economic overheating to challenge the central bank’s gradual pace of normalization. This in one reason why we expect yields to rise only gradually from here. Another: ongoing monetary accommodation by the European Central Bank and Bank of Japan given still muted inflation in Europe and Japan. 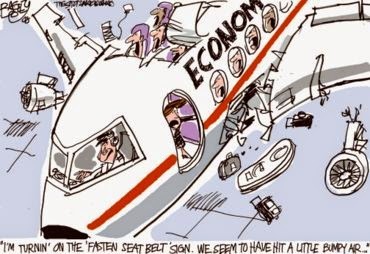 It is also why we like shorter-maturity U.S. debt. Last year was nearly nirvana for diversified portfolios. Returns were strong—and volatility was exceptionally low. 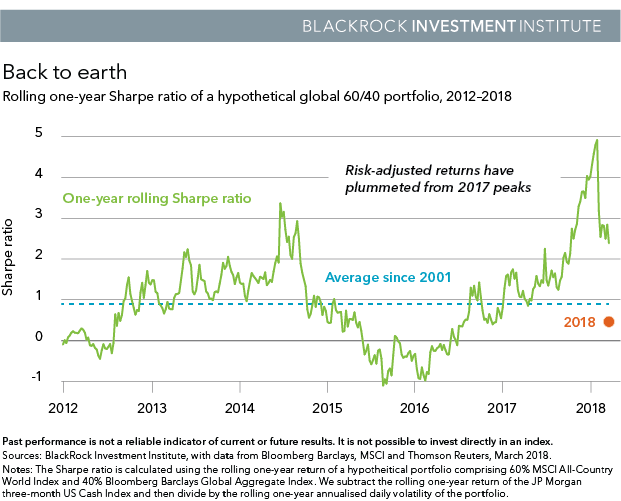 A hypothetical global portfolio of 60% equities and 40% bonds would have seen its Sharpe ratio, a measure of returns over cash relative to realized volatility, soar in 2017. See the Back to earth chart below. Yet more muted returns and rising cash rates challenge this dynamic as does volatility returning to more “normal” levels within the broader context of a low-vol regime. The 60/40 portfolio’s Sharpe ratio would have plunged this year. Another challenge: As rates rise, bonds may be less effective portfolio shock absorbers, meaning diversification needs a rethink. The rolling 90-day correlation of S&P 500 and 10-year U.S. Treasury daily returns has been negative for most of the new millennium, but periodic post-crisis “tantrums” have occasionally flipped the relationship. This means bond and stock prices can both go down at the same time. Also, the yield spread between U.S. Treasuries and corporate bonds has tightened, meaning credit offers thinner insulation against rate rises. What to own when bonds offer less shelter? Duration will likely still work when it matters most (global risk-off events), but we prefer higher-quality and shorter-maturity bonds. Read more about our asset preferences in our full Q2 2018 Global Investment Outlook.